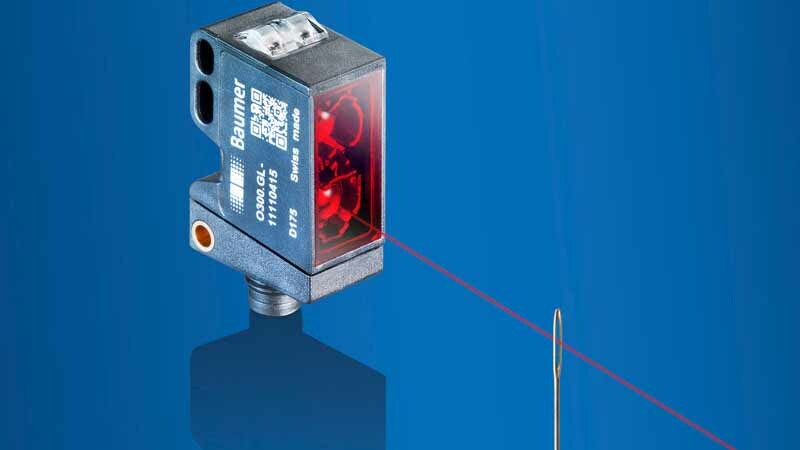 The new O300 miniature laser sensors with IO-Link by Baumer are the specialists for the reliable detection of very small objects and gaps. Thanks to a laser beam which focuses to within 0.1 mm and the high repeat accuracy of 0.1 mm, objects can be positioned with high precision and follow-up processes controlled exactly. Thanks to the extremely short response time of less than 0.1 ms, the sensor reliably detects even closely spaced objects, thus allowing fast processes and high throughput rates. A big advantage is the exact alignment of the laser beam to the fixing holes by design (qTarget). Thanks to qTarget, detection with pinpoint accuracy can be guaranteed over the entire series. The wear free teach-in method (qTeach) allows easy, user-friendly commissioning of the laser sensor. The weak point of the pushbutton or potentiometer is ruled out with the tamper-resistant teach-in method qTeach, thus offering maximum reliability and system availability. The O300 laser product portfolio impresses with its great diversity, offering tailor-made solutions for precise detection tasks. Among the five sensor principles to choose from, SmartReflect, the original light barrier without a reflector, must be highlighted. Even reflecting objects with a size of 0.5 mm can be reliably detected within a sensing distance of 250 mm. Stainless steel variants in a rugged washdown and hygienic design extend the typical applications of the O300 laser sensors for packaging plants in the food and pharmaceutical industries. Thanks to IO-Link integration, the O300 laser sensors are “Ready for Industry 4.0”. IO-Link allows the quick and easy configuration of sensors for all applications using standard network components. In addition, available additional data, e.g. for predictive maintenance processes, can be evaluated.